Try to think of an original area of research. Explain links between your investigation and areas of contemporary science that interest you. Use an original method of analysis. Communication: High marks will be awarded to students who are able to structure and present information and explanations clearly and using relevant scientific terminology and conventions (such as uncertainty). The best IA investigations are those that are original or take a new approach to investigating a topic. 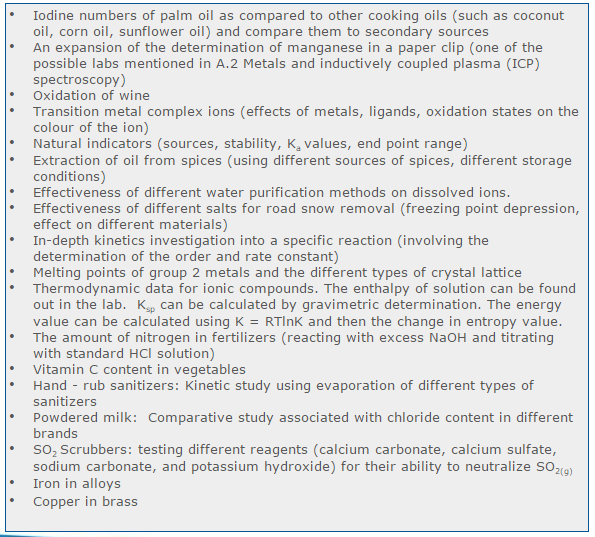 Above are some examples of research areas and topics that are given by the IB. Time will be allocated to test possible ideas and methodology in the lab before beginning the actual practical seesion.